Africason | African School | Africa son | History | Black Consciousness | Education: A Typical Example of How the World Bank and IMF Made Ghana Poorer. A Typical Example of How the World Bank and IMF Made Ghana Poorer. Typical Example of How the World Bank and IMF destroyed African Nations. The World Bank and the IMF (the International Monetary Fund) were set up during the end of the Second World War to rebuild the economies of Europe. However, in order for the world bank and the IMF to implement their policies, they (the world bank and the IMF) began offering loans to poor countries but only if the poor countries privatized their economies and allowed western corporations free access to their raw materials and markets. That was a poverty trap and many poor countries realized it when it was too late. We were already in chains. That was the beginning of much of the problems we face today in Africa. Now we are in a vicious cycle of poverty and there seems to be no way out. The western corporations flourish while the poor continue to die in poverty. In other words, the poor in Africa continue to feed the greedy rich corporations in the western world. The poor get poorer while the rich get richer. People continue to die from extreme poverty and hunger in Africa and other parts of the world but not so many people know the World Bank, The IMF and the WTO are behind almost all these. It is a new form of war whereby the rich western corporations use hunger and deaths as weapons of mass destruction. In other words, The World Bank, The IMF (the International Monetary Fund), and the WTO (the World Trade Organization) are the triple enemies of progress in almost every developing country in the world. Now let's see how the World Bank, IMF and WTO operate in Sub-Saharan Africa. Take a country like Ghana for example. Ghana is blessed with abundance of natural resources. The World Bank and the IMF are very interested in countries such as Ghana where they can easily control the natural resources and the markets. There used to be some prosperous rice farming communities in the northern parts of Ghana and the government of Ghana used to give those rice producing farmers some farming subsidies to enable them produce rice on a large scale to help feed the nation. 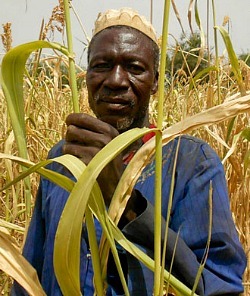 However, the world bank and the IMF stood in and told the Ghanaian government they (the world bank and the IMF) would not give Ghana any more loans unless the Ghanaian government cut the farming subsidies the government was giving to the poor rice farmers and the main reason behind it was that, Ghana had to import rice from western countries such as the United States (a major partner of the world bank and the IMF). Now Ghana imports most of its rice from abroad at huge prices every year. So at the end of the day, Ghana owes the World Bank and the IMF huge amounts of money but the money did not remain in the Ghanaian economy because Ghana had to use the loan to import food from abroad. Meanwhile, the rice producing communities in Ghana could have helped produce enough rice to feed the nation and even export some abroad to make more profit. Now the northern communities in Ghana remain the poorest in the country with no better jobs and no opportunities at all in most parts. Young boys and girls some as young as 9 are migrating to the southern parts of the country to major cities such as Kumasi and Accra (a very dangerous journey for kids) all in search for jobs so they can take care of their poor dying families back home. Most of these kids never return home. Some die along the way and some return worse than before and all thanks to the IMF and the World Bank. Although the money was returned to them, we still owe them. That is why most developing countries owe the World Bank and the IMF a lot in loans. Sometimes you hear "debt cancellations" and you may think they forgive poor countries their debts but that is not how it works in reality. The World Bank and the IMF never forgive and because of the huge debts developing countries owe the World Bank, they (the World Bank, The International Monetary Fund or the IMF, The World Trade Organization or WTO, and The United States of America a major partner of the World Bank) control almost all the affairs of those poor countries. In other words, if you don't obey what the World Bank and the IMF say then you must pay back the debt and because you cannot pay back the debt, you must obey whatever they tell you to do. Any leader who doesn't obey the World Bank, the IMF, the WTO, etc. is considered a "terrorist" and must be assassinated in most cases. For example, when there is an oil discovery in a developing country (that owes the World Bank) and the leader of that developing country is not ready to co-operate (so western corporations can easily take over the oil exploration), the World Bank and co quickly get rid of such a leader sometimes through war (just like what happened in Iraq). The World Bank elects their own "obedient" leaders to rule those poor countries so that they (the World Bank, IMF and co) can easily control that country's economy and market.